I now have internet access but no phone! A few months ago I received a telephone call from a company who wanted to combine my phone and internet lines, I said no thanks. They called back and got my son or husband, they said yes! The company called back, I asked a few more questions, and once more said no thanks, sorry my husband was mistaken he didn’t understand everything you said etc, etc. The thing is, I didn’t want to have to deal with more paperwork, everytime we have changed telephone provider, moved house, we have had problems and its me who has to deal with phone calls and paperwork as Jims french is much worse than mine. So the guys in this house harped on and on about changing and the deal was, only if it went smoothly and I didn’t have to deal with it all. Well THAT didn’t happen did it, we are now on day 4 of no phone, its driving me crazy, what is it with guys who have to change everything, upgrade everything, it almost never goes smoothly and if its not broken in the first place, why change? Creativa was the usual disappointment for me, I love the craft fair in Glasgow and always find something new to try out, here no. I did buy a felting kit for something that looks very complicated when I got out all the instructions but should be fun. 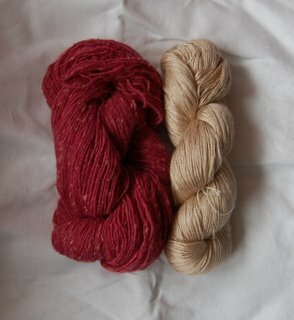 I did buy 2 skeins of wool, one is camel and silk and the other is 100% wool in a pretty colour. I would have liked this tweedy which came in aran weight for a jumper but he did not have enough of the colour I liked and I had no yarn amounts in my notebook! I bought some Tchai tea too which is yummy, just what I need today as its freezing. If anyone can explain COD and COI in french grammer in any way that helps me understand it, I will send chocolate, thanks….. I was disappointed with Creativa too. And very disappointed that there was so little yarn to be bought! I have taken the idea of the ‘Datcha” slippers from the Mercredi stand though, and am trying to knit them now – I kept going back to the stand, and trying to memorize what the pattern must be, and then scribbling down what I had seen, out of site of the stand! This time these will not be felted, but just knit plain on small needles. We’ll see…. My husband is just the same when offered the chance to change something. I can think of numerous occasions when I’ve had to tell eager salespeople, ‘Sorry, but we’ve thought about it and we’re not going to go ahead’, meaning, I’ve explained the downsides to him and he has agreed not to go ahead! The same thing happened to us when we moved. First no internet, then no phone. It has something to with cards and chips. My husband knew all along what the problem was (he’s a tech freak), and told them as much. It still took a week to fix. I love the colour of that tweedy wool! 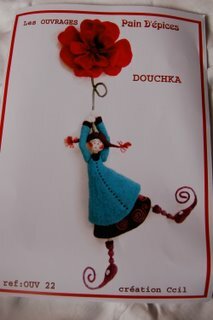 Your felting thing looks fun – interesting. If you’re still stuck with the grammar you should try asking Kathleen (KedKrafty)she’s a french teacher ! Hi Yvette, what do COD and COI stand for? The phone is working now. It would have went smoother had I not been so set on keeping my nice NETGEAR modem. Anyone want to buy a slightly used very nice, very good modem with built in WiFi?